There's something exciting about being unemployed and having the liberties of roaming the City of New York for feasts of glory. There are few times in life when the average working class citizen can be completely without [work] responsibility and really relish (sauerkraut, onions, and mustard) the simple comfort foods of the city. And although I had one week to do whatever possible before starting the next phase of my career, I decided to be a little daring and try to sandwich everything into one, single day. Add to the equation a second unemployed buddy, a little cash, and all systems were GO. t to start than in Times Square? First stop, Gray's Papaya. Gray's Papaya is the ULTIMATE street vendor. What they lack in mobility, they make up for in 24 hour service! The establishment has truly embodied the idea of "if you make it, they will come." There's not much else to it. Warning: Do not be fooled by other establishments with "papaya" in the name. They are certified funk fakers. In any case, we weren't that hungry yet and were well aware that today would be an epic eating day, so we intelligently opted to split the Recession Special! What is it? For the amazingly low price of $2.45 you can become equipped with 2 (count 'em), 2 high quality, juicy, hot dogs and 1 fruit drink of your choice (orange, grape, pina colada, coconut champagne, banana daiquiri, and papaya, of course). Our poison: Orange. 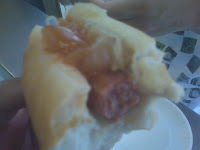 Topped with onions and sauerkraut on a mildly toasted bun, the frankfurter was delicious. The first bite provided that crunch and snap that every good dog should have. Caramelized onion and sauerkraut are such an interesting combination. The sourness of the kraut are offset by the sweetness of the onions, and that provides for a great tangy-ness. And what's not to love about the orange drink. It was cold, refreshing, orangey but not terribly sweet. Hell-O! If that doesn't get your salivary glands working, then there's something wrong with your mouth. Now that we had our palette teased, we were ready for more fantastic food. We had a toss-up to decide our next move. It was either the famous Lombardi's Pizza, known for being America's First Pizzeria (est. 1905) or St. Mark's 2 Bros. Pizza, a small chain on the corner of 38th St. and 8th Avenue, that we noticed had an extremely long line. Hunger pains started to set in. We had to make a decision quick. And now you know why. $1! The last time I saw a slice of pizza for that cheap was down at the Jersey Shore, and I've never see it that cheap in NYC. Amazing! For $1 there's almost nothing that can go wrong, right? Right! They did have a special as well. $2.75 for 2 slices and a can of soda. Not bad, if I do say so myself. But we just stuck to 2 slices and did without the caffeine. Normally with cheap pizza you get crust that tastes like cardboard, too much salt, watery tomato sauce, and cheese that's a grade below your last trigonometry exam score in high school. Thankfully, this plain cheese slice had decent flavor. It had a good mix of cheese and sauce. The crust was not burnt or undercooked; it was just right. And the best part was that it was fresh from the oven and quickly served. I think it was worth the short wait on that long line.